The 10 Days series manages to make geography fun by taking elements seen in boring games such as Rack-O and turning it into an engaging game. 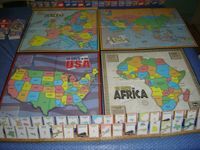 The first three games (USA, Africa, and Europe) were all quite similar but had minor differences that kept them different other than their geography. I was fairly excited about 10 Days in Asia (Out of the Box Publishing, 2007 - Alan Moon and Aaron Weissblum), for several reasons. One, I live in Asia, and it's nice to have a map with countries that I know and/or am near. Secondly, each game in the series feels different, and I was anxious to see what was involved in this game. Thirdly, I could finally play 40 Days around the World! (more on that later). The game board is placed in the middle of the table, depicting Asia from Japan to Papua New Guinea to Turkey. Each player takes two sets of racks - each numbered from one to ten, with slots to place ten tiles. A stack of tiles is shuffled and placed near the board. Starting with one player, players draw one tile, placing it in any open slot in their racks. This continues in a clockwise method, until all players have filled their racks. The rest of the tiles form a draw pile, with the top three being turned over face up next to the stacks, forming three discard piles. One player is chosen to go first, with play going clockwise. On a player’s turn, they may draw either one of the face-up tiles of the top card from the draw pile. They then can either place the tile they took in the rack, replacing the tile there (which then goes to one of the discard piles), or discard the tile they drew. Players are attempting to complete a 10-day journey, connecting all their tiles together. Tiles are either a country, a railroad, a ship, or an airplane. There are several rules concerning the tile’s order. - The first and last tile must be a country tile. - Country (state) tiles may be connected to each other if they are adjacent on the map. - A ship can be played to connect two countries that are each adjacent to that ocean (Indian or Pacific). - An airplane tile is one of five colors (red, yellow, orange, green, or blue) matching the country tiles, which are one of the five colors. An airplane tile can connect to country tiles, as long as both countries are the same color as the airplane tile. If the draw pile runs out, the discards are shuffled to make a new deck, with three more cards being laid face up. 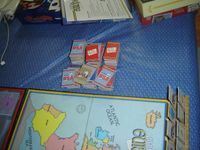 At the end of a player’s turn, if they can show that all of their ten tiles are connected in the proper order, following the above rules, they win the game! For my thoughts on the basic game, see my 10 Days in USA review, but I do enjoy the new features in Asia. -	Ships were introduced in Europe but have even a larger effect here, since many of the countries are islands and/or connected to few other countries. -	Railroads are a neat addition and make up for the lack of car cards (wilds) found in the first two games. The four railroad networks are well spread out and allow access to some of the more hard to reach countries. -	The map is the largest map of all the games (a six fold map) and has a different feel with a HUGE country - Russia, and multiple minute countries (Maldives and Bahrain, for example). -	The box is the same general size as the others in the series (with great design - of course) but is deeper, as the board is larger; and Asia has more cards than the other series. The black, red, and gold colors provide a stark contrast, and I might like the look of this game the best so far. In conclusion, while you certainly don't need Asia if you have the other games, it's a worthy addition to the series and would make a good jumping point. However, I think the best reason to get 10 Days in Asia is to play 40 Days around the World!! 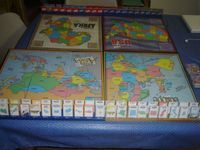 40 Days around the World is a variant that can be played using all four basic games of the 10 Days series thus far. It certainly can be played with less (and I'm sure more - when they add Australasia and South America), but four games seem quite wonderful. You see, Out of the Box Publishing kept this in mind when designing the games, because they used the same colors on all boards. Even more importantly than that, Russia and Turkey (on two boards) are the same colors; so it's like an extension to the map. Basically, 40 Days around the World is the same game, except you use all four games and must get forty tiles in a row instead of ten. Nothing is official, although I got all my ideas from OOTB, but here is what I did to play. -	Spread all four boards on the table, which take up a large area to play, although it is still the size of one Eagle game board. -	Mix all four decks of cards together and place them in six decks instead of three. -	Have six discard piles instead of three. -	A player must visit each continent once, but they can concentrate on one area more than others if they like. Players can fly from Asia to America back to Asia, and then take a ship to Africa, etc. -	The Pacific and Atlantic Oceans border the appropriate states on the USA board, and the Atlantic and Indian oceans border the appropriate countries on the Africa board. -	A player can use a plane to fly from one colored country (state) to the same color anywhere in the world. And that's basically it - the game has a similar feel, except it's much more epic in feel. Games take at least twice as long, and sometimes it can feel daunting to connect two spots. (In one game it took me a while to connect Iraq and New Jersey, but I managed). I don't know that I would recommend the game with more than three players, as downtime is greater (there's a lot to think about! ), but it's a tremendously fun two-player version. Oceans are very important, and you'll find a lot of people grabbing Europe and Asia cards to get the very powerful Atlantic and Pacific Oceans. However, cars are also quite useful, and I will draw a USA card in hopes of getting one of them, even when traveling in Asia. Airplanes become very important, as they are really the best way to get all over the world quickly. Since there are forty airplane tiles, colors are a bit easier to come by but expect them to be grabbed quickly. Played together as a group, the 40 Days around the World is easily one of my favorite games, taking the fun of the 10 Days series, and making it a tremendously strategic game. As I said, it's worth owning all four games just for this. Thanks for the review, Tom. May I enquire if the rules for the 40 days variant is included in the 10days in Asia box or do I have to download it from somewhere? The rules aren't anywhere right now, I got them straight from OOTB games. You can use my summary here and do okay. I couldn't tell you, really - they seem to have the same length. Likely, though, the area you are from will go slightly faster, if only because of familiarity with the geography. For example, most Americans will probably do best with the US map.